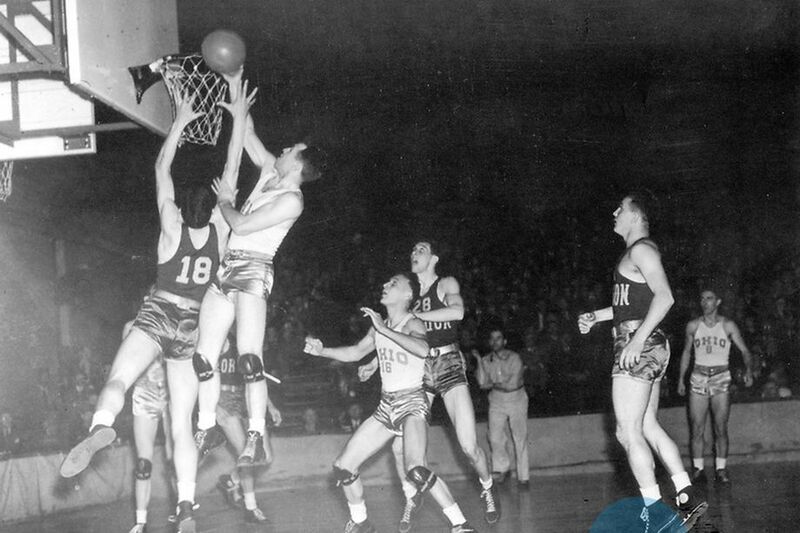 The league's very first game was played on Nov. 1, 1946; with the Huskies hosting the New York Knickerbockers at Maple Leaf Gardens. The contest drew 7,090, a good crowd considering that virtually every youngster in Canada grew up playing hockey and basketball was hardly a well-known sport at the time. Forget for now that the game the Knicks won that night, 68-66, bore little resemblance to the leaping, balletic version of today's NBA. That game was from a different era of low-scoring basketball, a time when hoops as a pro spectacle was just coming out of the dance halls. Players did not routinely double-pump or slam-dunk. The fact of the matter was that the players did not and could not jump very well. Nor was there a 24-second clock; teams had unlimited time to shoot. The jump shot was a radical notion, and those who took it defied the belief of many coaches that nothing but trouble occurred when a player left his feet for a shot. The group of owners who met on June 6, 1946, at the Hotel Commodore in New York to talk about a league they would name the Basketball Association of America couldn't have imagined today's NBA. They were composed primarily of members of the Arena Association of America, men who controlled the arenas in the major United States cities. Their experience was with hockey, ice shows, circuses and rodeos. Except for Madison Square Garden's Ned Irish, who popularized college doubleheaders in the 1930s and 1940s, they had little feeling for the game of basketball. But they were aware that with World War II having recently ended, the conversion to peacetime life meant many dollars were waiting to be spent on products and entertainment. They looked at the success of college basketball at Madison Square Garden and in cities like Philadelphia and Buffalo and felt a professional league, which could continue to display college stars whose reputations were just peaking when it was time to graduate, ought to succeed. Each team paid a $10,000 franchise fee, the money going for league operating expenses including a salary for Maurice Podoloff, who like the arena owners who hired him was a hockey man first. Podoloff, a New Haven, CT lawyer who was President of the American Hockey League, agreed to also take on the duties of President of the new Basketball Association of America, which three seasons later, in a merger with the midwest-based National Basketball League, became the NBA. With only five months to get ready for the targeted Nov. 1 season opener, the playing rules and style of operation were based as closely as possible on the successful college game. However, rather than play 40 minutes divided into two halves, the BAA game was eight minutes longer and played in four 12-minute quarters so as to bring an evening's entertainment up to the two-hour period owners felt the ticket buyers expected. Also, although zone defenses were permitted in college play, it was agreed during that first season that no zones be permitted, since they tended to slow the game down. Geography figured heavily in the makeup of the 11 franchises. The Providence Steamrollers relied heavily on former Rhode Island College players, while Pittsburgh chose its squad from within a 100-mile radius of the Steel City. The Knick players came primarily from New York area colleges. Even Neil Cohalan, the first Knick coach, was plucked from Manhattan College. But all of Toronto's players were American, with the exception of Hank Biasatti, a forward, who was a native Canadian. "The first two weeks we were at the Nevele by ourselves," remembered Sonny Hertzberg, the Knicks' first captain and a slick two-handed set-shooter. "The meals were great, but the coach wasn't satisfied. We did a lot of road work and were in great condition but Cohalan didn't like the way we were progressing. "Looking back, I'm still thrilled that I was at that first training camp and that I signed with the Knicks. I wanted to play in New York. It was a new major league. It was a game of speed with no 24-second clock when we played. I didn't know if it was going to be a full-time thing." While the Knicks were getting ready for the opener, college basketball was still king in New York, where teams like CCNY, LIU and NYU were revered. It was not until the Knicks scrimmaged the collegians and the successes got some newspaper notoriety that they started to gain some respect before they left New York on Oct. 31 for the train ride to Toronto. Picture the scene that cold autumn night when the Knicks had to stop for customs and immigration inspection at the Canadian border. The story goes that the customs inspector, noting the physiques of Knick players like Ozzie Schectman, Ralph Kaplowitz, Hertzberg, Nat Militzok and Tommy Byrnes, asked, "What are you?" "We're the New York Knicks," said Cohalan, who did the talking for the team. From the inspector's reaction, it was evident that he had never heard of the Knicks and probably not even of pro basketball. The notion was strengthened when he added: "We're familiar with the New York Rangers. Are you anything like that?" Deflated but unyeilding, Cohalan replied, "They play hockey, we play basketball." Before letting them through, the inspector added: "I don't imagine you'll find many people up this way who'll understand your game--or have an interest in it." Little did he or the players know that the NBA would grow into a multi-million dollar business with 29 franchises, including two in Canada (although the Huskies folded after just one season).